As for me, may my prayer unto You, O G‑d, be in an acceptable time; O G‑d, in the abundance of Your mercy, answer me in the truth of Your salvation. The Hebrew word Tefilah (תפילה) is generally translated into English as the word "prayer." But this is not an accurate translation, for to pray means to beg, beseech, implore, and the like, for which we have a number of Hebrew words which more accurately convey this meaning. Our daily prayers are not simply requests addressed to G‑d to give us our daily needs and nothing more. Of course, such requests are also included in our prayers, but by and large our prayers are much more than that, as we shall see below. Prayer is a commandment of G‑d;1 G‑d has commanded us to pray to Him, and to Him alone. In times of distress, we must turn to G‑d for help; in times of comfort, we must express our gratitude to G‑d; and when all goes well with us, we must still pray to G‑d daily that He continue to show us His mercy and grant us our daily needs. In our prayers to G‑d we often address Him as our Merciful Father, or as our Father in Heaven, for G‑d regards us, and we regard ourselves, as His children. '2 The question may be asked, Why do we have to pray to our Father in Heaven for our daily needs? Does G‑d not know our needs even better than we our-selves? Is G‑d not by His very nature, good and kind, and always willing to do us good? After all, children do not "pray" to their loving parents to feed them, and clothe them, and protect them; why should we pray to our Heavenly Father for these things? Like all other commandments which G‑d has commanded us to do, not for His sake but for ours, He has commanded us to pray to Him for our sake. G‑d does not need our prayer; He can do without our prayers, but we cannot do without our prayers. It is good for us to acknowledge our dependence on G‑d for our very life, our health, our daily bread, and our general welfare. And we should do so every day, and many times a day. We must often remind ourselves that our life and happiness are a gift from our Merciful Creator, for we should then try to be worthy of G‑d's kindnesses and favors to us. G‑d does not owe us anything; yet He gives us everything. We should try to be the same way towards our fellow-men and grant favors freely. We should express our gratitude to G‑d not merely in words, but in deeds: by obeying His commands and living our daily life the way G‑d wants us to do, especially as it is all for our own good. Knowing that G‑d is good and that nothing is impossible for Him to do, we can go about our life with a deep sense of confidence and security. Even in times of distress we will not despair, knowing that in some way (best known to G‑d) whatever happens to us is for our good, a blessing in disguise. We do not like to suffer, so we pray to G‑d to help us out of our distress, and grant us the good that is not hidden or disguised, but the good that is obviously good, obvious even to our fleshy eyes and limited understanding. We gain strength, courage and hope in our trust in G‑d. Our daily prayers strengthen our trust in G‑d. In G‑d We Trust has been our Jewish motto since we first became a people.4 Its adoption by the American people when it became a "nation under G‑d," commendable though it is, is, of course, not original. 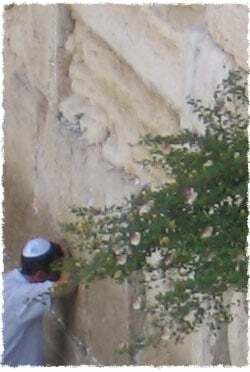 Our Sages declare that the ladder which our father Jacob saw in his dream, with angels of G‑d "going up and coming down on it," was also the symbol of prayer.5 By showing the ladder to Jacob in his dream, a ladder which "stood on the earth and reached into the heaven, our Sages explain, G‑d showed Jacob that prayer is like a ladder which connects the earth with the heaven, man with G‑d. The meaningful words of prayer, the good resolutions which prayer brings forth, are transformed into angels which go up to G‑d, and G‑d sends down angels with blessings in return. That is why Jacob saw in his dream that angels were "going up and coming down,"6 although one would have expected angels to come down first and then go up again. Thus, what we said about prayer in answer to the question: "Why do we pray?" is but the first step on the "ladder" of prayer. On a higher level prayer has to do with things that are higher than the daily material needs, namely spiritual things. The Hebrew word tefilah (תפלה) comes from the verb pallel (פלל), "to judge. "'7 We use the reflexive verb lehitpallel ("to pray"), which also means "to judge oneself." Thus, the time of prayer is the time of self-judgment and self-evaluation. When a person addresses himself to G‑d and prays for His blessings, he must inevitably search his heart and examine himself whether he measures up to the standards of daily conduct which G‑d had prescribed for man to follow. If he is not one who fools himself, he will be filled with humility, realizing that he hardly merits the blessings and favors for which he is asking. This is why we stress in our prayers G‑d's infinite goodness and mercies, and pray to G‑d to grant us our heart's desires not because we merit them, but even though we do not deserve them. This is also why our prayers, on week-days, contain a confession of sins which we may have committed knowingly or unknowingly. We pray for G‑d's forgiveness, and resolve to better ourselves. Prayers help us to lead a better life in every respect, by living more fully the way of the Torah and Mitzvoth which G‑d commanded us. On a still higher level, prayer becomes avodah, "service." The Torah commands us "to serve G‑d with our hearts,"8 and our Sages say: "What kind of service is 'service of the heart? '—it is prayer. "'9 In this sense, prayer is meant to purify our hearts and our nature. The plain meaning of avodah is "work." We work with a raw material and convert it into a refined and finished product. In the process, we remove the impurities, or roughness, of the raw material, whether it be a piece of wood or a rough diamond, and make it into a thing of usefulness or beauty. The tanner, for example, takes raw hide and by various processes converts it into a fine leather. The parchment on which a Sefer-Torah is written, or a Mezuzah, or Tefillin, is made of the hide of a kosher animal. So is raw wool full of grease and other impurities, but through various stages of "work" it is made into a fine wool, from which we can make not only fine woolens for our clothes, but also a Tallith, or Tzitzith. The Jewish people have been likened in the Torah to soil and earth, and have been called G‑d's "land of desire. "10 The saintly Baal Shem Tov, the founder of Chasiduth, explained it this way: The earth is full of treasures, but the treasures are often buried deep. It is necessary to dig for them; and when you discover them, you still have to clear away the impurities, refine them or polish them, as in the case of gold, or a diamond, and the like. So is every Jew full of wonderful treasures of character—modesty, kindness and other natural traits, but sometimes they are buried deep and covered up by "soil" and "dust," which have to be cleared away. We speak of a person of good character as a "refined" person, or a person of "refined" character. It entails an effort, and very often a hard effort, to overcome such things as pride, anger, jealousy and similar bad traits, which may be quite "natural" but still unbecoming for a human being, least of all for a Jew. Tefilah, in the sense of avodah, is the "refinery" where the impurities of character are done away with. These bad character traits stem from the "animal" soul in man, and are "natural" to it. But we are endowed with a "Divine" soul, which is a spark of G‑dliness itself,11 and the treasury of all the wonderful qualities which make a man superior to an animal. During prayer, our Divine soul speaks to G‑d, and even the animal soul is filled with holiness. We realize that we stand before the Holy One, blessed be He, and the whole material world with all its pains and pleasures seems to melt away. We become aware of the real things that really matter and are truly important, and even as we pray for life, health and sustenance, we think of these things in their deeper sense: a life that is worthy to be called "living"; health not only physical, but above all spiritual; sustenance—the things that truly sustain us in this world and in the world to come, namely the Torah and Mitzvoth. Let us consider this idea a little closer. Every Mitzvah which G‑d has commanded us to do, and which we perform as a sacred commandment, attaches us to G‑d. The word Mitzvah is related to the (Aramaic) word tzavta, "togetherness," or "company." In English, too, we have the word to "enjoin," which means to "command," for the commandment is the bond that joins together the person commanded with the person commanding, no matter how far apart the commander and the commanded may be in distance, rank or position. When a king commands a most humble servant to do something, this immediately establishes a bond between the two. The humble servant feels greatly honored that the king has taken notice of him and has given him something to do, and that he, an insignificant person, can do something to please the great king. It makes him eager to be worthy of the king's attention and favor. If this is so in the case of every Mitzvah, it is even more so in the case of prayer. For nothing brings man closer to G‑d than prayer, when prayer is truly the outpouring of the soul and, therefore, makes for an "attachment of spirit to spirit," as mentioned earlier. If any Mitzvah brings us closer to G‑d, prayer (on the level of which we are speaking) is like being embraced by G‑d. It gives us a wonderful spiritual uplift and blissfulness, than which there is no greater pleasure and fulfillment. Prayer, we said, is like a "ladder" of many rungs. To get to the top of it, we must start at the bottom and steadily rise upwards. In order to be able to do so, our prayers have been composed prophetically by our saintly prophets and sages of old, and have been ordered also like a "ladder," steadily leading us to greater and greater inspiration. We must, therefore, become familiar with our prayers: first of all their plain meaning, then their deeper meaning, and finally, with the whole "order" of our service. Rambam Code, Hil. Tefilah 1:1-2. Guide, III, ch. 36; See also chs. 44 and 51. Zohar I, 149B; Torah Or, 88A; Likutei Torah, Beshallach 2B. "Thus, the time of prayer is the time of self-judgment and self-evaluation. When a person addresses himself to G‑d and prays for His blessings, he must inevitably search his heart and examine himself whether he measures up to the standards of daily conduct which G‑d had prescribed for man to follow." Prayer I was searching Hebrew meaning for prayer and directed to this page. it is a great page with so much insights which gave me a deeper understanding of prayer.